Well hello there, Susty Party people! 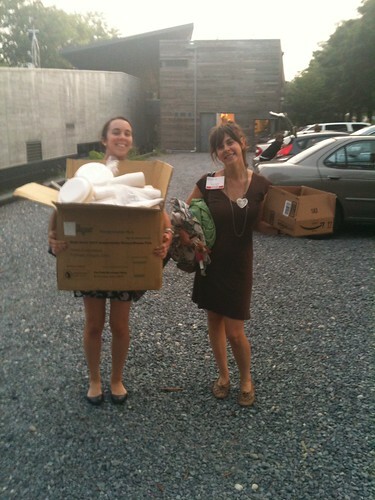 My name is Jenna and I am the Summer 2011 intern here at Susty Party. My love and passion is in everything eco friendly, the creatively practical world of marketing, and my beloved family and friends, and I am lucky to say that I have found all three of those things in this company. I have had the ongoing pleasure of working directly with Jess and Emily all summer, and I must say, for a Midwestern college student used to marketing projects involving simulated products, it has been quite an involved and wonderfully real experience. I have been doing a ton of target marketing research, meaning that I have been looking at green restaurants, clubs, organizations and blogs that can potentially have some interest in our way of partying (if you are reading this and are interested, shoot me an e-mail at jheffernan at sustyparty.com. To be quite honest with you, I’m pretty nerdy, so I really enjoyed exploring the exponentially expanding green industries all over the country! It’s refreshing to see that a large portion of the public still has a desire to live their lives in an environmentally friendly way and are constantly looking for ways to do so. Simultaneously, I have been learning even more about the new millennial ways of Public Relations and Marketing, aka using twitter and Facebook effectively for your business, and not just for posting your own pictures from last Friday night (tweet us at @sustyparty and we will holler back at you! ), all while starting to influence the actual Susty Party Facebook and twitter accounts. It’s not every day that an intern doesn’t have to go get the coffee (unless I want some), let alone have any kind of an influence on the marketing of a new and growing business. I would have to say that it’s pretty awesome! 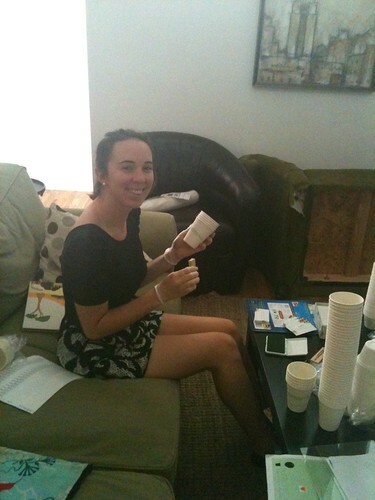 Happily stamping cups at the office in Brooklyn! My favorite part of interning for Susty Party has been the warm inclusion that I have felt in the company since reaching out to them for an internship position this summer. And that warm feeling? It can be taken literally, especially in the scorching heat that took over Brooklyn in July! But in all seriousness, when I got to sit down with Emily, Jess, and Nathan to discuss a future marketing plan that blossomed from an idea of mine, it was the best brunch I had all summer. And the delicious omelets and fresh squeezed orange juice only had a slight effect on that ;). It is these kinds of experiences, mixed in with the smaller projects that I am dealt on a weekly basis (hello, stamping cups with personalized stamps for our customers while listening to a mix of favorite songs from the Susty girls!) that keep the aura of hard work mixed with fun that is Susty Party alive. 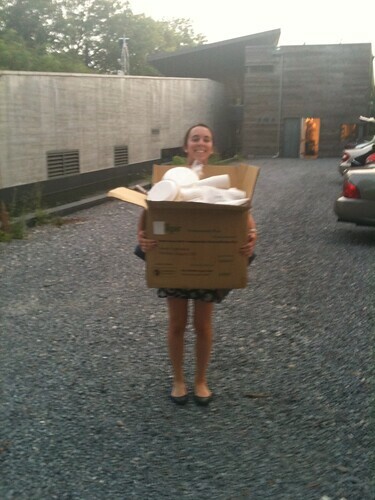 I hope to keep partying Susty style for a long time, and I hope you will join me!